What Do Employers Look For During a Job Interview? Hiring standards have changed dramatically over the years, and interviewers require more than ever from potential applicants. Long gone are the days of generic questions applicants could answer with a simple yes or no. Today’s employers don’t just want a candidate that can say yes to everything. That’s why they have started developing interview questions and styles that are intended to spot inconsistencies and gaps in applicant responses. Knowing this is very beneficial to job applicants and allows them to properly prepare ahead of time. In addition, carefully analyzing the position and the questions interviewers ask helps you decide whether it really is the right one for you. Your body language says as much about you as the words that you speak. In fact, body language is often the very first thing that an interviewer notices about you. They are looking for confident employees who will be good representatives of their company. 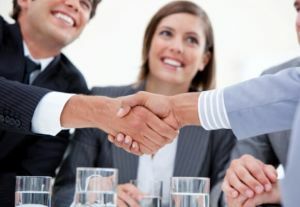 Employers notice firm handshakes and candidates that sit up straight during the interview. Avoid crossing your arms or slumping and maintain eye contact with the interview. Candidates who constantly look down at their hands or at objects in the room seem distracted an uninterested. If you are nervous and worried that it shows, just say so up front. Most interviewers can sympathize with uneasiness. When an interviewer asks you to tell them about yourself, they are looking for very specific answers. Stay away from personal topics, which may be interesting but irrelevant to the job. Instead, focus on your career accomplishments and the character traits that make you perfect for the job. Those with long work histories should avoid droning on for long periods of time. Think about the job in advance and prepare a list of three to five topics that make you the perfect fit. Employers aren’t looking for bragging; they are looking for comfortable confidence. When candidates are knowledgeable, they come across as a colleague discussing business topics rather than as an applicant just trying to impress an interviewer. One of the biggest factors that employers are looking for is enthusiasm. This doesn’t just mean that you are alert and happy, although those are important aspects. It also means that you seem engaged in the company and in asking pertinent questions about its operations. Research the company and social networking pages well before the interview to gather information from its website. Employee LinkedIn pages can also be a useful tool for research. These resources should provide you with information on new company products or awards that can stimulate thought-provoking questions to discuss with the employer. Additionally, pay special attention to the questions that they ask you and read between the lines. It’s just as important for you to evaluate the interviewer’s enthusiasm about the company as it is to show that you have it. Above all, remain positive during the interview, even when discussing difficult topics, such as past employers. Remaining positive in the face of adversity is a highly sought after skill for most employers. Instead of asking themselves what do employers look for during a job interview, job candidates should evaluate the position and the employer just as much as the employer evaluates them. Consider it your job to poke holes in the employer’s story as well, but in a nice way. By preparing the right list of questions beforehand, you can accurately evaluate whether the company really does have a family atmosphere, or whether they just wish they did. Whether you live in Michigan or around the country, the employment experts at Vertical Media Solutions can guide you toward a successful career move. Our certified resume writing and interview preparation services are designed to emphasize your professionalism. Learn how we can help today: 616-631-4300.